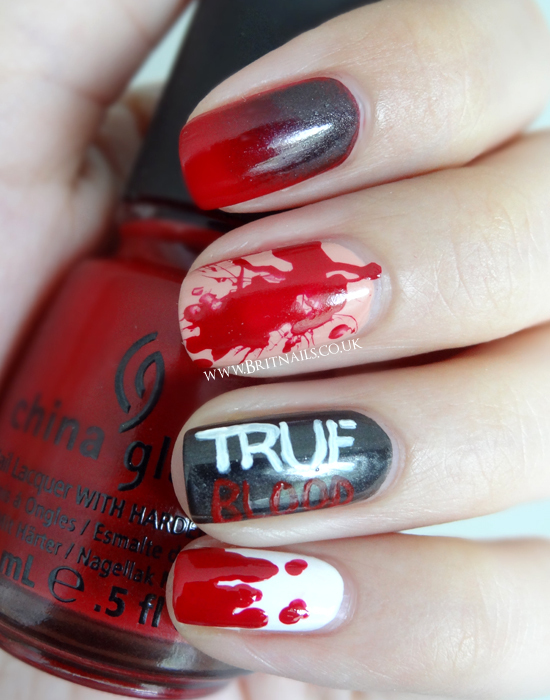 Red and black gradient, blood spatter, an attempt at the logo and some blood drips. The red is China Glaze Winter Berry, a perfect blood-red that I got on sale in Sally's for £2! If you want to know the other colours used, just ask in the comments. Also, I think it's time I made a Facebook for my blog. I've been avoiding it as lord knows Facebook is a pain. All of you who have one for your blog, did you make the page from your regular personal account, or did you make it completely separate? What is the best way to do it? Love these! I watched the new episode earlier, was it just me that wasn't completely wowed by it? I didn't feel like it was a massive welcome back episode. I originally created a completely different Facebook account to set it up, as I wasn't sure how it would be with my main Facebook page. But once it was created, I added my personal account as an admin, so now it's always on my homepage and I can just update it as and when I want to, if that makes any sense to you? I haven't actually seen it yet! I'm watching it tonight! Yeah I know what you mean! That's why I made a new account cause I didn't want people who know me to see things about my blog, haha! I still haven't let me boyfriend read it, there's just something about letting people I know IRL see it that scares me! Thanks so much for the help! I think I've managed to set it up now. Good to know it'll be hidden from my personal facebook! i made a fan page for my blog, so its still my account, but it doesnt mix with my regular facebook page. Haha thank you :D I think I've managed to set up a page now. Just got to figure out how to use it...damn timeline. I love love love this manicure! Amazing! Ahhh, incredible. 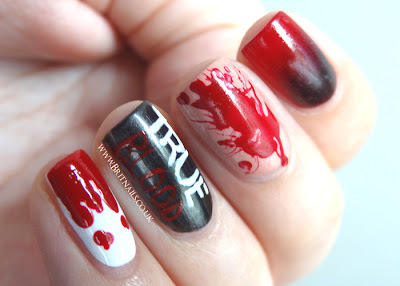 I only ever watched the first season of True Blood on DVD as I don't have HBO but I loved it. I definitely need to recreate something like this - awesome work, lady! Love the mani! 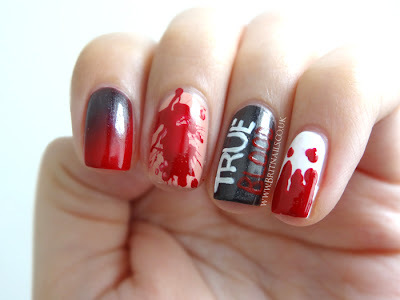 My issue with True Blood is that the books are so much better - and so different. It's been kinda painful to see the show veer so far off course from the storyline in the books. Still, I love me some Alexander Skarsgaard! Do a separate page for your FB and set it up with networked blogs so you don't have to think too much about it. This looks so awesome! I love red/black/grey gradients. 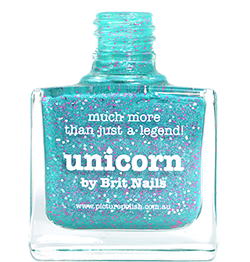 THIS IS AMAZING AND I WANT TO MARRY IT TY. How did you do the gradient? Hey somehow missed this the first time round, caught it on your favs of 2012 - would you mind telling me what the black is? I've been looking for a shimmery dark grey like that for a while. thx!